1 1/2 story, 3x2 bay vernacular structure w/some Greek Revival and Queen Anne elements. 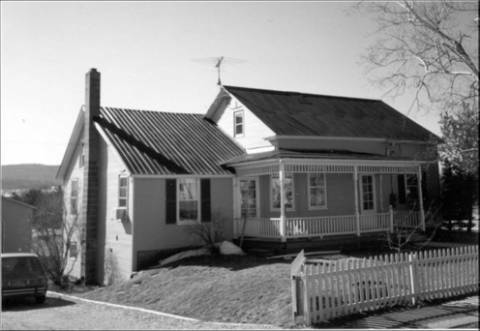 Sheathed in clapboards w/a metal gable roof, cornerboard and frieze. There is a one story wing on the southeast side that is an early addition. There is also a porch on front that has turned posts, valance and railing. Molded cornice returns. The center front entrance has plain detail. Windows are 2/2 in lip molded surrounds. The southeast corner of the main block has been cut away making room for a window set at 45 degrees.